I am very excited and honored to report that my work is featured in the December 2018 issue of Pastel Journal!! 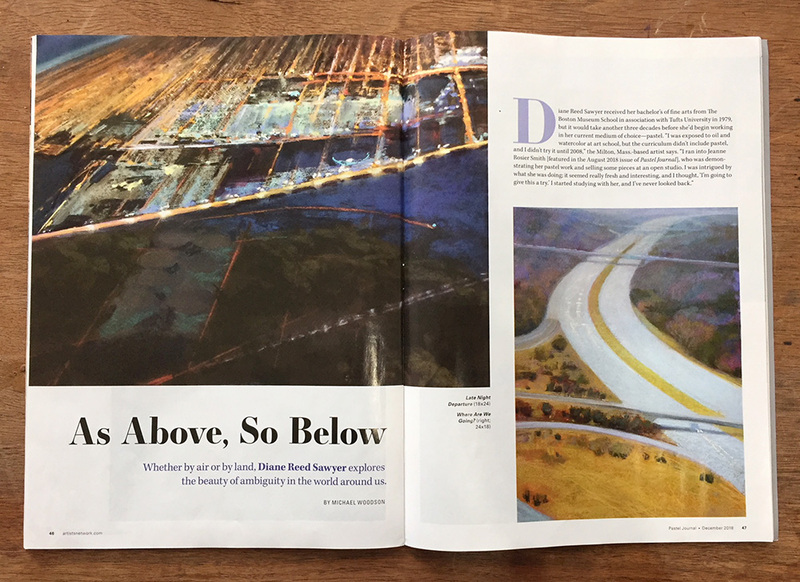 The 10 page article, “As Above, So Below,” focuses on a series of paintings I have been working for the past few years—aerial images of the earth based on the view from the window of a passenger plane. In this series I have been exploring the way the world from this perspective is familiar but startlingly different. When seen from the air at night, whole cities flatten into patterns of light. At dawn, we see the sun rising over the curve of the earth illuminating the landscape below. We fly over mountains and valleys scored with the marks of glaciers, and rivers poisoned by centuries of industrial pollution and human habitation. I find working on these pieces is kind of magical. A few strokes are enough to suggest the vast landscape below. I like keeping my marks a bit ambiguous as it leaves room for the viewer to imagine for themselves what they are seeing. I am attracted to both what is revealed in these images, and that which remains hidden. My goal is to offer the viewer an invitation to explore the space between what we know and imagine. A big thank you to the editors at Pastel Journal for featuring my work!! To purchase a discounted copy of the December issue of Pastel Journal click here. Please leave me your comments. I’d love to hear your thoughts on this recent work. The painting on the opening spread of the article, “Late Night Departure” received the Pastel Society of America Award in October at Renaissance in Pastel, the Connecticut Pastel Society’s annual national juried show. “ElectriCity”, another painting from this series, was also awarded a prize at Pastel Society of Cape Cod’s national juried show For Pastels Only in June. Opening this weekend! If you’re in the Boston area, five of my aerial “mini’s” are currently showing at Francesca Anderson Fine Art in Lexington as part of her 34th Annual Miniatures Show, November 14-January 12th. You are invited to the opening and holiday party December 1, 3-5pm. 56 Adams St., Lexington, MA. The show is filled with unique and beautiful works perfect for giving. The end of the summer marked a big transition for me, moving from our home of 28 years near Boston MA to our new home in North Adams, MA, about as far west and north as you can go and still be in Massachusetts. This fall has been a time of change and new beginnings. Our new home is in a centuries old mill that was converted to artist Iive-work space in 2006. We share the building with visual artists, musicians and writers. In the stairwells, the railings and steps are worn and polished by the passing of generations of textile workers. Layers of paint still clinging to the old brick seem to echo the dappled pattern of the fall leaves outside our windows. Our loft is beautiful, but still a work in progress. There is still much to be done to balance its two purposes: to be a home, and a working studio. But this gentle space, filled with light, promises to be a snug and nurturing sanctuary full of possibilities. I will post more photos after we get settled in. Wishing you all a wonderful holiday season. I hope your days and nights are bright with discoveries and new opportunities.